You are here: Home › News › News › End-of-life Equipment: More Recycling, Less Disposal. End-of-life Equipment: More Recycling, Less Disposal. The challenges of safely handling the mountains of excess or outdated PCs, cell phones and related devices that are generated on a daily basis have been with the IT industry for decades and will remain as long as the industry exists which, of course, will be forever. The current dynamic seems to be an increasing awareness of the need to carefully track where retired gear ends up after leaving the enterprise. This concern – which can largely be satisfied by sound business practices in vendor selection – exists within the state, national and international levels. The goals remain to retire electronic gear without compromising any residual information that may be left on it and to do so in a way that is environmentally safe. A big part of that, according to Eric Harris, associate counsel and director of governmental and international affairs for the Institute of Scrap Recycling Industries, is controlling the message and making recycling rather than disposal the first – or even the only – option. Controlling how people think about things is a vital long-term issue. For instance, 30 years ago, laws on seat belts were just being implemented, and as many people did use them as didn’t use them. It is safe to say that now most people buckle up almost without thinking about it. The same change can be seen in attitudes to smoking. Both of these represent the transition that ISRI wants to see in the attitude toward retired electronic gear. Harris said that more progress is being made on the commercial side, but that the consumer side lags a bit. Exporting: Helping or Hurting the Recipient Nation? Virtually everyone agrees with the overall aim of improving the environment. As with any societal goal, however, the road to success is winding. One of the key issues that is being dealt with is what level it is permissible to send materials overseas for refurbishing or destruction. Robin Ingenthron, the owner of Good Point Recycling, a recycling firm headquartered in Middlebury, Vt., points to a conflict over how used electronic devices are handled. On one side of the issue are those who feel that sending them overseas leads to haphazard handling, exploitation of workers and despoliation of the local environment. On the other side are those who feel it is possible to send end-of-life devices anywhere as long as proper steps are taken. Furthermore, this group maintains that refurbishment of old devices can allow them to serve very important roles in developing countries. Erecting legal and regulatory barriers to this is counterproductive, these folks maintain. One of the issues that clearly will loom large during the next few years is whether or not states will put restrictions on sending used electronic devices overseas. Ingenthron says that Vermont has issued draft legislation that would make it illegal to export devices for refurbishing. It doesn’t seem that the two sides of the debate – those who think sending electronic devices overseas is likely to lead to abuses and those who think doing so is legitimate and can even help the developing economies – are so far apart that they can’t eventually end up on the same page. 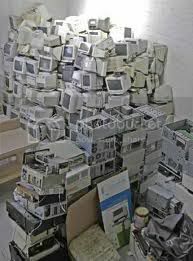 Harris suggests that the business sector is a bit ahead of consumers in accepting the idea that recycling is the wave of the future and that dumping is an antiquated way of handling old electronics. It is important to remember that what is happening on the consumer level is important to businesses for at least a couple of reasons. In the first place, the line is not carved in stone, since many SMBs discard their electronic devices as consumers do. Secondly, teleworkers employed by businesses of any size are likely to use this avenue of divesting themselves of unwanted equipment. The good news is that proactive steps apparently are being taken. Miller said that 24 states – home to two-thirds of the nation’s population – have laws that require some sort of consumer-level electronic waste collection. A few more states likely will establish rules, he said. The biggest outliers, he said, are Georgia, Ohio and Florida. He hopes that an infrastructure develops that can more effectively recycle antiquated gear. That would be something of a double benefit: Not only is the material in the old smartphone, PC or other device kept from doing harm, but the reuse reduces the amount of raw materials taken out of the environment to make new devices. At the end of the day, the proper handling of retired electronics has a huge impact on the organization. These devices often carry sensitive information, no matter how much effort is given to cleanse them. In addition, careless treatment can harm both the environment and the company’s reputation and, finally, get it into regulatory or legal hot water. GLEN BURNIE PCRETRO ONE DAY EVENT! $50 Pentium 4 systems for the first 25 customers.